Encouragement: Therese McHugh, Marian Eugene, Joey Melville, Vivien Dolar, Karen Luzan and Archbishop Mark Coleridge after the Queensland University of Technology Mass. BRISBANE Archbishop Mark Coleridge has celebrated a Mass with QUT’s Freedom Catholic Mission on Campus – a lay Catholic movement committed to the Church’s call of evangelisation. Archbishop Coleridge encouraged students to consider their time on campus as a tremendous gift. During his homily he spoke of an infamous documentary film and warned the students not to fall for the trappings of false knowledge. “Some years ago I saw a film that I remember well and which left a mark on my mind and perhaps even my soul. It was called The Smartest Guys in the Room,” he said. “It was about the spectacular collapse of one of the biggest firms in the USA, and indeed in the world, called Enron. “Enron was run by men who were the smartest guys in the room. But you see they built an empire on the foundation of lies and trickery, and in the end it was the house built on sand, and the whole mighty empire of Enron came crashing down and with it so too did the smartest guys in the room. Archbishop Coleridge drew from St Paul’s letter to the Corinthians to exhort students to turn away from self-importance that could so easily be harboured when acquiring knowledge. “St Paul says: we have knowledge, yes, but knowledge puffs up. “That’s what happened with the smartest guys in the room. They were puffed up. The Archbishop asked, “Why have you been given this gift? To acquire knowledge, yes. Archbishop Coleridge, who is no stranger to the academic realm, spoke of a greater knowledge we were commanded to learn. “Jesus puts it to us – and it sounds crazy – the great art, or knowledge, that we have to learn is enemy love,” he said. “In the end that’s the criteria of how successful you will be in your learning. 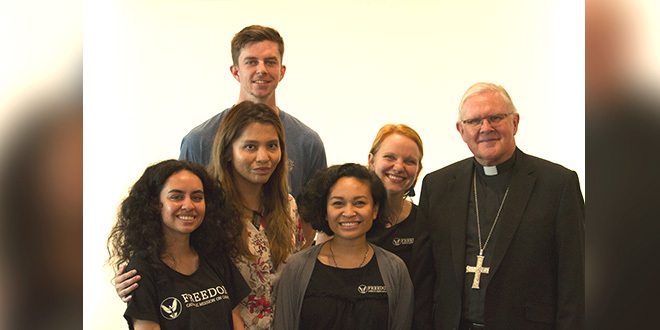 Freedom Catholic Mission on Campus is committed to the Church’s call of evangelisation, and challenges university students to live in the fullness of the Catholic faith. “CMC encourages and empowers students to discover the freedom of living a Christ-centred life by sharing the Gospel message and discovering who they are made to be, and who they were made by,” CMC’s Vivien Dollar said. “Freedom does this by being authentic witnesses on campus, running weekly faith studies with students, encouraging participation in the sacraments (including Mass on campus twice a week), one-on-one discipleship and mentoring, as well as connecting students into the greater Catholic community within the archdiocese and beyond.” Ms Dollar said CMC hoped to help Catholic students during a difficult time for the Church.